If You Can Fix Soles, You Can Save Lives. If my Granddad were still alive this year, we’d be celebrating his hundredth birthday. We often made fun that his birth was the second major disaster of 1912. When he died he took a thousand stories with him. And just as many songs. He was a guarded man. The few stories we shared only offered a glimpse of the life he’d lived. Born in a field in the Ukraine. Before the First World War. Before the Russian Revolution. His mother cut the umbilical with her teeth. A break from picking potatoes. His childhood years saw rural adventures punctuated with death and hunger. His brother, shot dead for stealing fruit. His father, an officer of the Tzar, died in a prison for being anti-Communist. He left the Ukraine and travelled Russia during the famine. Searching for food and work. Some of the stories I overheard as a child were the background for my first nightmares. What I most remember, and in some ways is his legacy in place of the missing stories, were his skills. A proud man, an emotional man, his first passions were poetry & music, but denied an education because of his fathers politics, he chose to repair things, to make things, create things. He taught me to tie my laces, but with a special knot. He taught me change a plug, to solder, to fix a radio, a TV. He taught me nothing was broken that couldn’t be fixed. And I believed this. Even as I watched him lose the ability to walk, as a worsening limp forced him into a wheelchair. As failing eyes made him blind. Most of the stories I now remember came from afternoons sat with my housebound Grandfather. A man too proud to seek medical attention until forced. A man who occasionally told me how proud he was of me. Of where I had been, of what I had seen, but mostly that I had listened to him. Learned from him. And that those skills would live on after him. 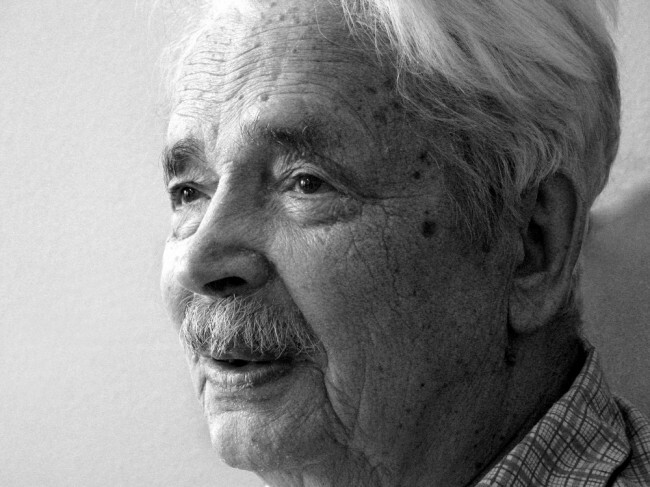 He shared more stories and tales in his last year than all of the years before. I would sit and listen to him, or we would both listen to his treasured short wave radio. Like our lives depended on it. He could translate the crackled tales from five different languages. He told me words were the only tools left to him. He gave me his hat telling me there was no weather indoors. He gave me his watch as he could no longer see it. He gave me his shoes with the metal heel taps. It’s his words though that I treasure the most. That I’m writing here in case I forget to pass them on. It made him sad to fade away. To avoid death for 91 years and yet have his physical abilities stripped slowly away in the last 20. When helping my Grandmother tidy her house the other day, I came a cross a carrier bag under the stairs. It was like I’d found treasure. 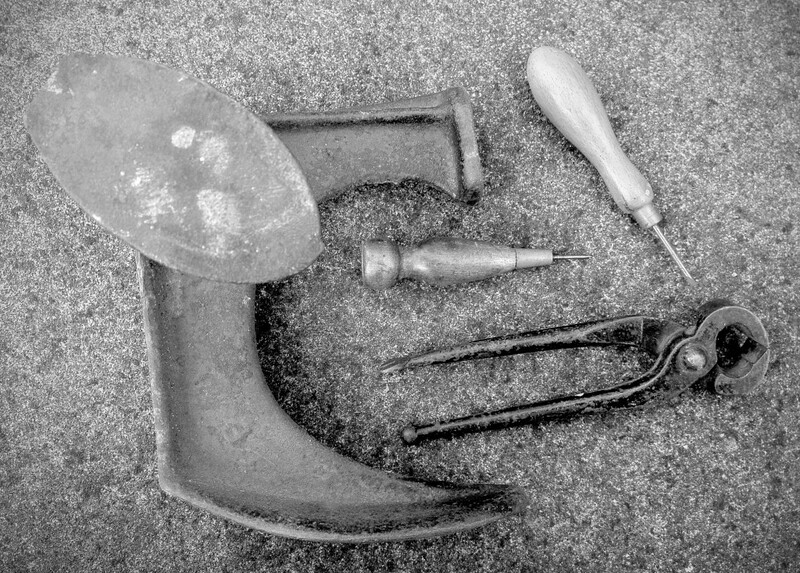 Inside were a handful of tools and a cast iron shoe repair anvil, a cobble. 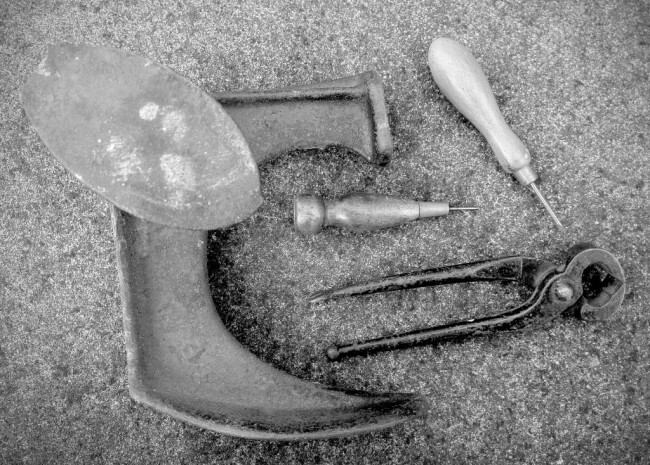 These were my Grandfathers tools. His words sit in my memory and now these tools sit in my hands. I find a beautiful momentum in the journey both these tools and my Grandfathers words have made. It’s comforting to think that there may be a certain immortality to our ideas and creations. Here’s to capturing stories and knowledge. They slip through our life like sand through our fingers. Great post. I read this on CowBird and was touched by such a beautiful story. Great writing Christian, you really got me.